There are any number of good reasons for making a documentary film, but bringing to public attention a possible miscarriage of justice, where an individual may be facing a life sentence or worse for crimes they may not have committed, is definitely one of the best. The wrongful arrest strand of investigative documentary has as its godfather Errol Morris's mighty and magnificent The Thin Blue Line, a film that was at least partly responsible for freeing Randall Adams from death row, and has a prodigal son in Joe Berlinger and Bruce Sinofsky's 1996 Paradise Lost: The Child Murders at Robin Hood Hills, an extraordinary work that opened an international debate on the guilt or innocence of its young subjects. At first glance, Free Lisl: Fear & Loathing in Denver is a title that suggests a similar cinematic campaign for justice, but director Wayne Ewing is up front about the fact that his subject, Lisl Auman, has already been freed after serving several years of a life sentence. His prime objective is to highlight an injustice and the potential for wilful misinterpretation made possible by an archaic point of law, and to document the campaign that helped bring the case to wider public attention and the contribution of its most renowned participant. All of you should know the name of Hunter S. Thompson, and if not then you should stop reading this and immediately research the man and his work. Probably his most famous (some might say notorious) achievement was Fear and Loathing in Las Vegas, a brilliant, insane, drug-fuelled diary of his own journalistic adventures in the late 1960s that for many of us is one of the defining literary works of the modern age. Thompson's reputation as the wild man of journalism has followed him since, with the focus always on the wild, and one of the most pleasing aspects of Ewing's film is the glimpse it provides of the man behind the media image. That he is almost the only key participant for the defence who is not interviewed is due to a tragedy of circumstance, one that gives Auman's story a sad final twist that her own participation in this film is clearly designed to at least partly address. I realise that by name-checking two of the best films in this particular sub-genre I may be creating unfair expectations for Free Lisl. Auman's case in neither as complex nor riddled with inconsistencies, contradictory testimony, legal tomfoolery and outright prejudice as those of Randall Adams and Damien Echols, although it does have its share of all of these. The really suspect evidence boils down to just two testimonies and one alleged action on Auman's part, and there are no last-minute surprise twists in the tale to drop the jaw. Structured primarily around a campaign rally organised for the day of Auman's appeal hearing and the speeches made in support of her case, this is as much a record of events as an expose of the misdeeds of those in authority. But it is still a tale worth telling and one that is well told. 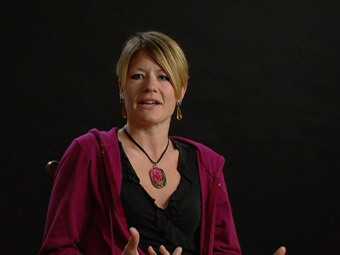 Rather than presenting the facts in a linear fashion, Ewing introduces us first to his central character, then to the idea that she was unjustly imprisoned, and only later fills in the details of how she landed in jail facing life without parole and why the case against her was called into question. This proves a very effective way of presenting a story whose facts could be effectively covered in about twenty minutes of screen time, adding as it does an element of intrigue and mounting disbelief as the story unfolds. The very reason I have not gone into any detail about Auman's case – all I'll tell you is that she was convicted aged 21 of the murder of a Denver police officer, despite being handcuffed in the back of a police car when the incident occurred – is because to do so would be to rob the film of what effectively amount to its narrative twists, and frankly you'd do better to hear them from the filmmakers than from me. This is likely to be especially true for a UK audience, few of whom will be familiar with the Auman case and the subsequent campaign to free her. 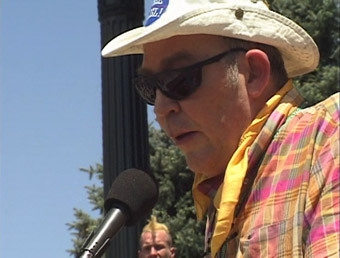 It is inevitable that the film should be sold on the involvement of Hunter S. Thompson, just as his image and name were featured so prominently in the newspaper reports of the campaign rally, and it does serve as a fitting tribute to the author's final battle with the powers that be. But by telling Auman's story Ewing and his team also highlight an aspect of American law that, while perhaps well intentioned, is clearly and worryingly open to misuse, with serious consequences for anyone caught in its blast. The film also hints at deeper concerns, arrestingly summed up by Berkeley professor Timothy Ferris, who suggests that at the present rate of increase, America will soon have imprisoned an even higher proportion of its population than either Stalinist Soviet Union or Apartheid South Africa, a statistic that should rattle even the most complacent of viewers. Free Lisl: Fear and Loathing in Denver makes for involving and eye-opening viewing and is worth hunting out if you have an interest in films that explore the justice system at its shakiest. If I have one complaint it's the presentation of sideways scrolling textual information at the same time as sometimes crucial audio. Maybe it's a sign of my slowing up in the age of information overload, but I more than once had to pause and rewind to read what I'd missed through listening, and just as well, as otherwise I would have failed to catch a key piece of evidence regarding fingerprints (or the lack of them) that helps make a mockery of the prosecution case. Shot on what looks like DigiBeta or equivalent high-band video, the 4:3 transfer has been made from the video original and looks close to pristine, being pin sharp with excellent contrast and faithful colour reproduction. A variety of source material, including news footage and reports and police taped interviews (the latter looking like second generation VHS) are included, and the quality of these is generally as a good as could be expected. The Dolby 2.0 soundtrack is of similarly impressive quality. The packaging doesn't state whether it's mono or stereo – I couldn't detect any separation but the clarity of the recording is excellent, Warren Devon's open-air performance of 'Lawyers, Guns & Money' sounding almost as if it was recorded and mixed in a studio. The quality inevitably drops off a bit in the source material, but this is appropriate to the material. The name of Wayne Ewing may not be well known to UK audiences, but those who know their TV may recognise him as the man who designed the revolutionary photographic style of Homicide: Life on the Street, for my money the finest cop show ever to hit TV screens anywhere. In recent years he has carved out a niche for himself making documentaries based around the life and activities of Hunter S. Thompson, with titles that include Hunter Goes to Hollywood (2003), Breakfast with Hunter (2003) and When I Die (2005), as well as the investigative political documentaries Benched: The Corporate Takeover of the Judiciary and the Last Campaign (both 2005), none of which, to my knowledge, have been widely seen in the UK. Free Lisl suggests that they deserve to find a wider audience, but tracking them down is a job for the dedicated – I couldn't find Free Lisl on any of the usual on-line retailers, including Amazon, but you can get it directly from Ewing's own site at www.hunterthompsonfilms.com, along with Breakfast With Hunter and When I Die.